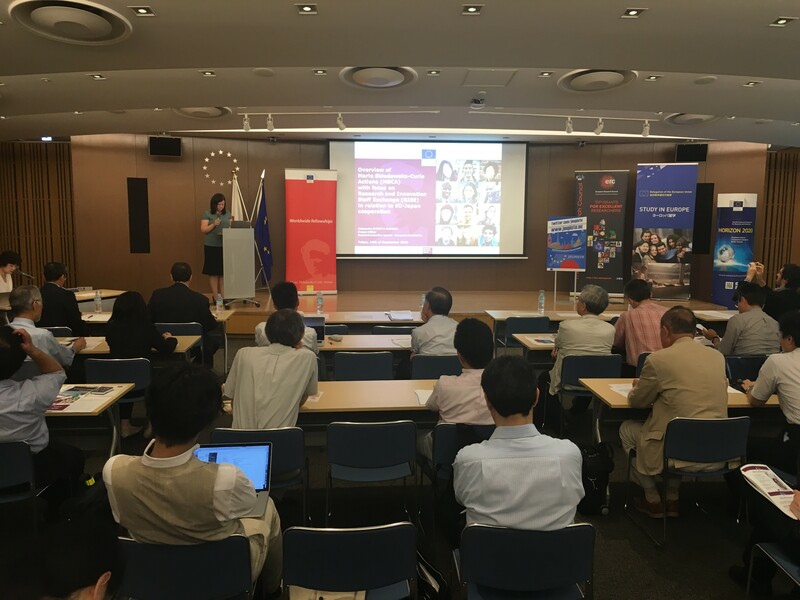 On 16 September 2016, the National Contact Point for Horizon 2020 in Japan and the JEUPISTE project (Japan-EU Partnership in Innovation, Science and Technology) organised a seminar on the Marie Skłodowska-Curie actions (MSCA) in Horizon 2020. 50 people participated from universities, research organisations and companies in Japan. In particular, detailed information was provided on the Research and Innovation Staff Exchange (RISE) programme by Ms Aleksandra SCHOETZ SOBCZAK from the Research Executive Agency (European Commission). A new call for prososals for RISE projects will open in December 2016. RISE facilitates staff exchange and is the most widely used mechanism for EU-Japan research cooperation under Horizon 2020. The target for this action are organisations that would like to strengthen their links with Europe. The members of a RISE project can share knowledge and broaden the career development of their staff. Through the project, they can develop sustainable collaborative projects and exchange best practices across borders and sectors. At this seminar, two projects were presented with Japanese partners that are already participating, namely the INCAS project and the INTELUM project.